Chief Financial Officer (CFO) plays the most crucial role in the success of any organization. Their primary job responsibility is to optimize the financial performance of a company, including its liquidity, reporting, and return on investment. Supply chain, information technology (IT), procurement, and almost all the other departments report to the CFO to efficiently manage cash flow within an organization and to ensure the department meets its financial obligations. So, the communication with this highest ranking executive has to be done methodically for business success. Our Chief Financial Officers Mailing List provides complete contact information of these key professionals that lets you reach CFOs in the USA, Canada, UK, Australia, Middle East, South Africa, Asia, and other parts of the world. It includes authentic, verified and reliable data that can power your multi-channel marketing initiatives and unlock seamless interactions with your targeted audience. We also believe that each business has a separate identity and a definite market. Reasoned to the same, we offer pre-packaged as well as customized CFO Email Database to help you better align your marketing strategies with your business goals. Finance is one of the most imperative factors on which the success or failure of a business relies. Chief Financial Officers have a greater say in money matters, which is why marketers always lookout for ways to connect with them and communicate their messages across. However, it is never an easy job. Aware of the intricacies faced by marketers in reaching out to the top financial decision makers, Blue Mail Media can help you with its CFO Email List and Mailing List. Our database is designed to provide you direct access to communicate with top financial executives via telephone, mail or email. This eliminates multiple gateways of communication and ensures faster turnaround times and greater return on investments. Blue Mail Media’s skilled team of data scientists, analysts, and experts dig out the most qualitative data and maintain its credibility by constantly updating it with newer information. Our team makes millions of phone calls and sends across thousands of emails every month to verify our information with authentic sources and ensure our data is accurate to the best of our knowledge. 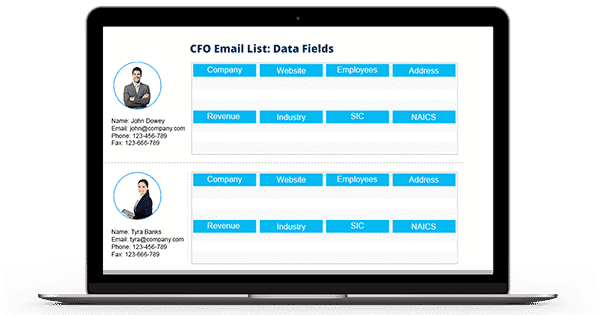 With Blue Mail Media’s CFO Email List, you can execute your marketing campaigns flawlessly across North America, Europe, ASIA, Australia, New Zealand, Africa, Middle East and South America. 1. How vast is your CFO Database? Blue Mail Media’s extensive list of CFO currently encompasses over 62,700 authentic and validated Contacts from an array of industries throughout the world. Our dexterous team of marketing professionals and data scientists is leaving no stone unturned to add more to the list. 2. What is the accuracy rate of your CFO Executives Mailing List? Our Chief Financial Officers Mailing List holds an accuracy of 80-85% as it is updated and verified on an interval of 3 months to ensure a constant authenticity of the records. 3. How do you collate the records in your CFO Email Addresses? To maintain the credibility of the CFO Email Database, we collate the records by using years of research, cutting-edge technologies and industry-specific sources like Yellow Pages, Business Directories, Trade Shows, Company Newsletters, and more. 4. Do you provide customized CFO Email Lists? Yes. We discern the need of flexibility that marketers look for in their marketing database, and thus we give you the option of customizing your CFO List as per the selects – industry type, company name, company size, SIC/NAICS code, geographic locations, and more. 5. Is your CFO Mailing Lists compliant with CAN-SPAM? Yes. Our Chief Financial Officers Mailing List is compliant with the CAN-SPAM law, and we ensure to maintain the legal consent throughout the process of validating and updating the database.